Friday, 4:30 pm, Salon A/B: It’s Dangerous to Go Alone! Take This–Writer Support Networks in the Bay Area. Panelist. Scene: The writer types alone, perhaps with a bottle of bourbon for companionship and a cat on the lap. The writing lifestyle is often portrayed as solitary, but as with all careers, writers need support to improve and to get their work seen by the wider world. Come learn what resources are available for speculative fiction writers in the Bay Area, from critique groups, to marketing, to writing classes, to kicking back and talking writer shop with others going through the creative struggle of the written word. Saturday, 10:00 am, Salon F: Discovering Short Fiction. Panelist. We live in golden age for short SFF, but there’s so much out there and relatively few reviews and recommendations compared to novels. How are people finding short fiction? What are some techniques the panelist can suggest for those looking to read more short stories? And what can the community do to help showcase the awesome short fiction happening now? Saturday, noon, Lobby Bar: East Bay Science Fiction and Fantasy Writers Meetup Group Craft Klatsch. Host. Join my East Bay critique group for SF/F writers during Saturday’s lunch hour in Fogcon’s lobby bar to unwind from the con so far and catch up on what’s been great and what folks are looking forward to next. Saturday, 8:00 pm, Salon F: Small Houses, Big Futures–Publishing SF with Small Presses. Moderator. While many of us dream of a Big 5 deal, there are numerous Small Press publishers that are taking risks the larger publishers can’t, giving more writers access to the market. But that access comes with smaller (or no) advances and a larger proportion of labor on the author. What’s different about publishing with a Small Press vs. a big publishing house? How is the experience different, for the editor and for the writer? 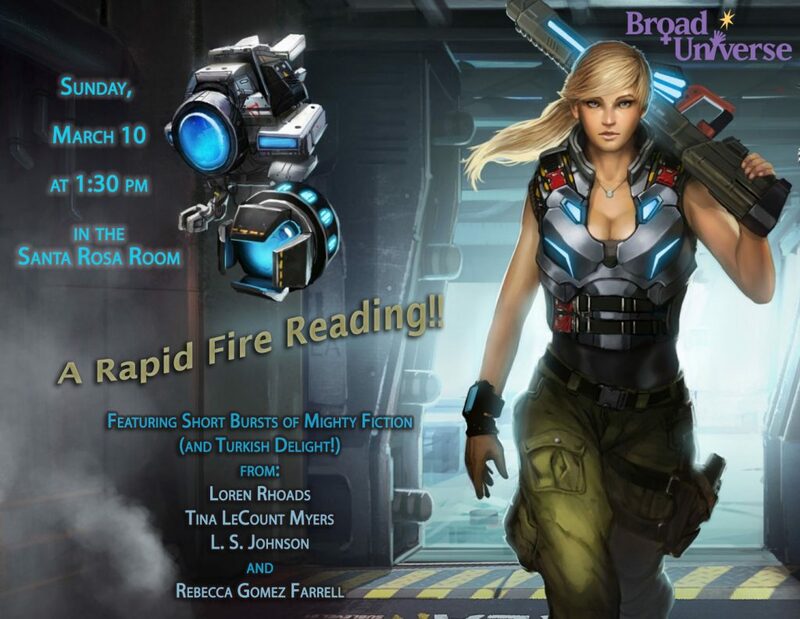 Sunday, 1:30 pm, Santa Rosa room: Broad Universe Rapid Fire Reading. Host and Reader. Broad Universe is one of the oldest organizations supporting female writers of speculative fiction. 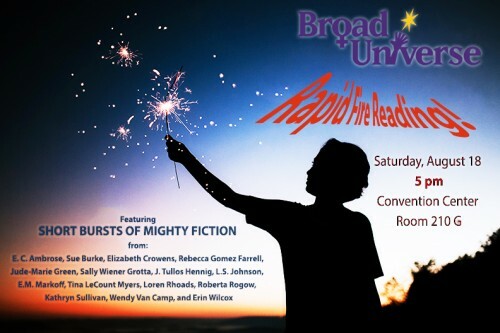 At conventions nationwide, Broad Universe hosts Rapid Fire Readings to highlight the amazing work of our members. Several members of the group take part by sharing short bursts of fiction that keep the reading lively and exciting. And from there…home! Is it wrong that I’m looking forward to that last part already? Come to the Alameda Author Series on 2/25! I would love to have you join me in Alameda for this author event. As I’m the only author on the agenda, I am a bit nervous about having a turnout…this is why I usually invite more authors to read with me. 😉 RSVP through Eventbrite right here, and yes, it’s free. I will have copies of Wings Unseen available for sale. Host Kevis Brownson and I will have a conversation about my writing and the organizations I’m involved with, then I’ll do a reading, then there will be audience Q&A, and then a signing and reception to wrap up the evening. 6 pm is early! So don’t worry about sliding in a bit late. 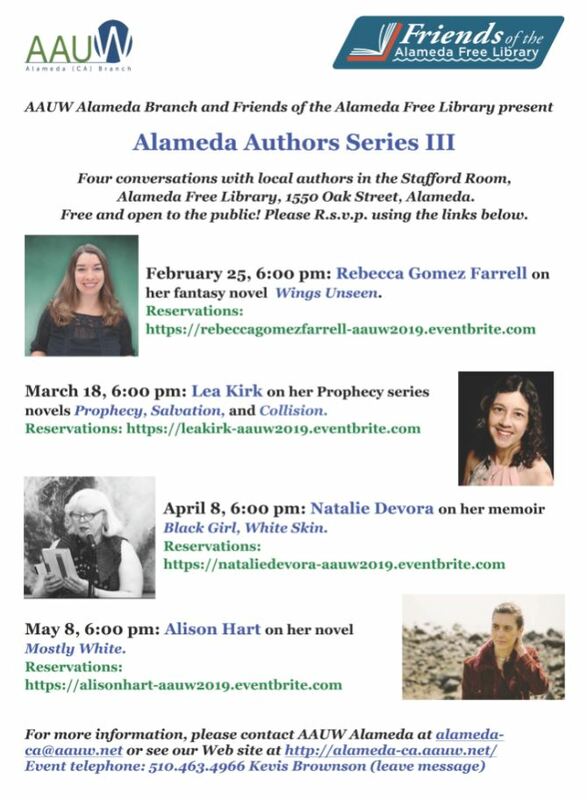 Here’s the series description: For the third year, the AAUW Alameda presents a spring series of talks featuring authors who live and write in Alameda and nearby, now co-sponsored by the Friends of the Alameda Free Library. Our February author Rebecca Gomez Farrell will discuss her novel Wings Unseen and her current writing projects. 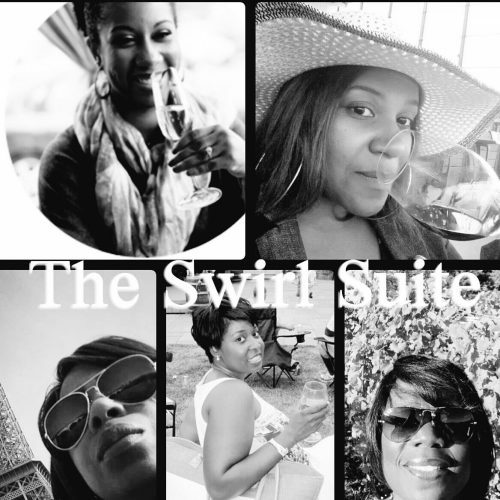 Come Wine with Me on the Swirl Suite Podcast! Catching up on appearances I’ve made over the past couple of years for food and fiction, and lo and behold! I never promoted my episode of the Swirl Suite podcast from last year! I love this group, or “squad” as they call themselves, of female wine and spirit professionals of color, based mainly in the DC area. Last year, they did a series, “Get to Know a Wine Blogger,” and I was thrilled to be asked to take part. 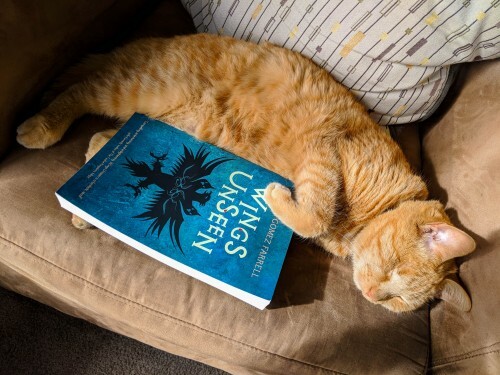 Surprisingly, the only subject that’s out of date is that my fantasy novel, Wings Unseen, is no longer coming out but has been out for a year (pick it up on the right –>). Oh, and we’re a year past that Wine Bloggers Conference in Santa Rosa as well. Details, details. Otherwise, it’s a pretty fun interview! In this 42-minute episode, you’ll first listen to Sarita (Vine Me Up), Glynis (Vino Noire), Leslie (Vino 301), Tanisha (Girl Meets Glass), and Melissa (the Liquor Lady) talking about summertime humidity, Juneteenth, and Oz restaurant’s Happy Hour in Arlington, VA. About eight and a half minutes, the ladies start chatting up myself and Tivon of Von Vino. Tivon and I talk about how we got into wine blogging, how drinking it got us into wanting to record it and learn more about it. Then we all talk about the wineries we visited most recently and I say “like” way too often, as per usual. I’m a California Valley Girl – I can’t help it. Great tips follow for advice to wine bloggers just starting out, our favorite happy hours (shoutout to the Libertine! ), we play a word association game, and a surprising truth is revealed — very few of us keep cases of wine at the ready! I also share some of my fiction writing process, which I’m in the depths of on two different books right now. That direct Soundcloud link is right here. Or check out the show below on Youtube, which I queued up to right before my and Tivon’s introductions. Thanks for tuning in! And thanks to the Swirl Suite Squad for having me. It Takes a Village – Pursuit of Publishing Panel at Litquake! This Sunday, 10/14, at 3:30 pm, I’ll be on the Pursuit of Publishing: It Takes a Village Panel at Litquake! This is my first ever Litquake appearance, and I’m excited to participate. Panel description: What does it take to create and sustain a writing community? CCA’s Leslie Roberts discusses strength in numbers with Mary Volmer (Hedgebrook), Scott James (Castro Writers Coop), Casey Bennett (Lit Events for the Lit-Minded), and . . . me! 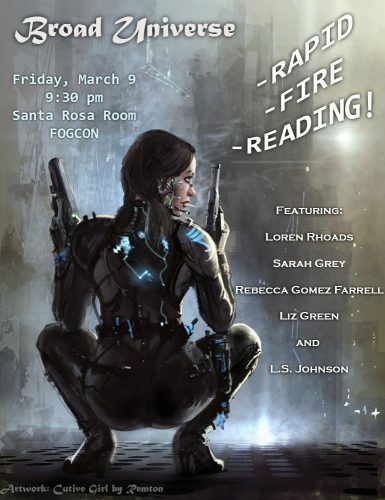 I’ll be sharing about my work co-helming the East Bay Science Fiction and Fantasy Writers Meetup, a San Francisco chapter of Women Who Submit Lit, and two closed Facebook groups for female writers – one for speculative fiction writers across the globe and one for writers of all stripes in the Bay Area. Some tickets will be available at the door, but a few tickets are still online for $25. That price includes three earlier panels on the same day, all designed to aid writers on their path to publication. All four Pursuit of Publishing panels will take place at the Timken Auditorium of the California College of the Arts at 1111 Eight Street in San Francisco. Worldcon 76 starts on Thursday, and I am excited! 8 pm: SF in SF presents George R. R. Martin in conversation with John Picacio at the Fox Theater, benefiting Locus Magazine! This is not an official Worldcon event, but it is Worldcon adjacent. 12 am to 1:30 am: The Science Fiction and Fantasy Writers of America (SFWA) Hospitality Suite. I’ll be on Door Dragon duty, checking SFWA memberships and IDs for entrance. 1 pm to 1:25 pm: I’ll be signing books at the SFWA table in the Exhibit Hall. 6:45 – 8:45 pm: Ghost Hunting Tour! You too can sign up for this downtown San Jose tour led by Bay Area Ghost Hunter Adrienne Foster. $15, I think. 10 am: How Would Civilization Evolve if…: How Human and Nonhumans Would Evolve Based on Their Environment – This is a panel being led by professors from my alma mater, UC Santa Cruz (banana slugs, forever! ), so I’m making sure I’ll be in attendance. 210 E at the Convention Center. 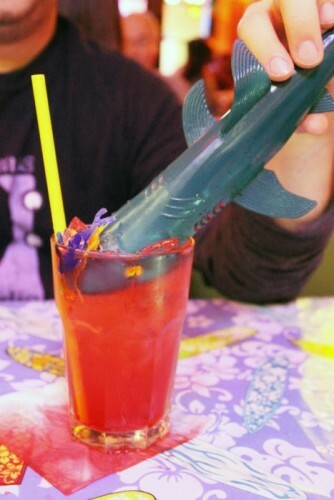 2 pm: Craft Klatsch with the East Bay Science Fiction and Fantasy Writers Meetup group – This is an offsite event for members of the Meetup group that I co-helm in the East Bay. You are welcome to join us and learn more! Here’s the Meetup event. I don’t really know how the Hugos work…but I’m planning to attend or watch a simulcast or whatever the case may be. Help me? Midnight – 1:30 am: I’ll again be Door Dragon for the SFWA Hospitality Suite. The last day of Worldcon, alas. I will likely catch some friends’ readings in the afternoon then head home to Oakland and the husband and kitties. Whew! That schedule is only of events I *know* I’ll be attending, though a good many of my days are full with potential plans already. Always feel free to tweet at, Facebook message, or email me to try and find a time to get together. Or a drink at barcons, as it goes. Cheers to that! 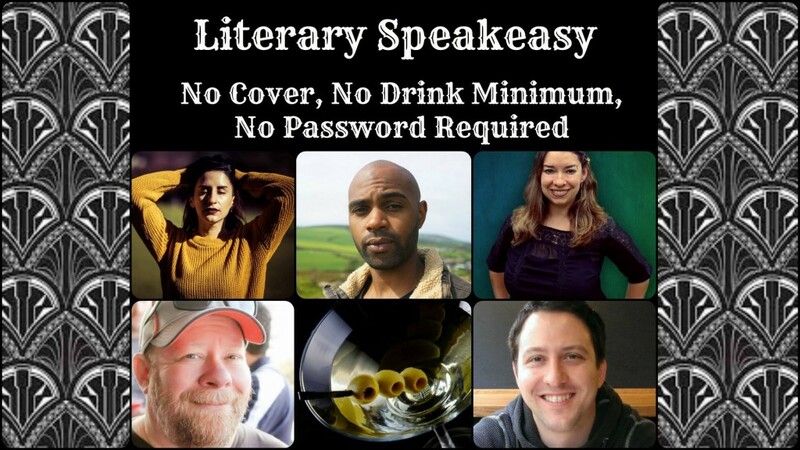 Literary Speakeasy – Speak Easy with Me on 5/31! Tomorrow night (5/31) at 7 pm, I’m reading at the Literary Speakeasy, an awesome collection of writers from many genres, curated by James J. Siegel, a San Francisco-based poet and all-around great guy. Here’s the Facebook invitation. The Literary Speakeasy takes place at Martuni’s, everybody’s favorite bar for karaoke and fruity, high ABV cocktails on the corner of Valencia and Market in San Francisco. Head straight toward the back room to find us. James always makes sure the energy is warm and welcoming, and I’ll make sure to read you some stories that’ll entertain. My fellow readers this evening will be Rohan DaCosta, Bud Gundy, Chad Koch, and Riss Rosado. There will also be a raffle! Come take in the unexpected journey through five writers’ minds, with a cocktail as your compass. See you tomorrow! Moshin Vineyards Salon Series Reading! Live in wine country? Come check out the Reading Between the Vines Salon Series at Moshin Vineyards in Healdsburg! On Monday, March 19, 2018 at 6 pm, I’ll be reading in Moshin’s tasting room as part of this unique literary series (Full info here). Reading Between the Vines celebrates the writers in residence for the Writing Between the Vines fellowship, for which I was a runner up last year. Writing Between the Vines is an organization that offers yearly retreats for writers, sponsoring their lodging at the host wineries. Can you imagine the freedom to write unfettered with a beautiful winery for your scenery? Talk about a dream…I really need to re-apply this year! Sounds like Rick’s work will have us salivating! See you at Moshin next Monday. Find me at FogCon this coming weekend! I’ll be moderating, sitting on panels, and giving a reading during this jam-packed three days of speculative fiction lovers and writers coming together in Walnut Creek. The Borderlands vendor table will have copies of Wings Unseen for sale, should you be looking to pick up a copy. And I’ll have a pen for signing, of course. Don’t be shy, just come up and ask for that signature! Among many other qualities, Shakespeare was a master of using plays within his plays to amplify his themes and plot arcs. This technique of self-reference has been used for dramatic and comedic effect in many works. Orson Scott Card had Ender Wiggin playing through a story game that ultimately tied into and reflected his “real life” story; P.C. Hodgell has traditional stories in her novels that shadow the main action; Stephen King pulled the ultimate coup and wrote himself into his Dark Tower series as a character, incorporating his struggles with substance abuse into the decay of the universe; Michael Ende’s novel The Neverending Story famously loops in on itself. Is this an effective tool for writers to use? What makes it work and when does it fall flat? Let’s analyze the phenomena! As scientists learn more and more about our astonishing universe, from the macro to the micro, does science begin to awe and inspire, as religion can? Does religion fall away, or evolve? How does science affect our mood, our hope, and our outlook on life? What might religion look like in “the future” (very scientifically advanced societies, such as in Ada Palmer’s Terra Ignota series)? And immediately after that, I’ll be participating in the Broad Universe: Rapid Fire Reading at 9:30 pm. This is the second year we’ve done a rapid fire reading at FogCon. They are a fun way to liven up a reading, cycling through the authors two times, reading short selections rather than a longer work. The variety never stops! Broad Universe is an organization that supports the work of female speculative fiction writers. Wilderness is an interstitial space, existing between cities, roads and settlements. People have held many different views of wilderness form a place to be tamed, to a place to be preserved. Yet the idea of “untouched” wildlands remands problematic. Recent scholars such as William Cronon have questioned if wilderness even exists. How have works such as Lord of the Rings, Zahrah the Windseeker by Nnedi Okorafor & Mirror Empire by Kameron Hurley engaged with these ideas? How will our changing ideas about wilderness effect new and future work? Interested in attending FogCon? More info here. Let me know if you’re coming! Though I will not be on the agenda after the Wilderness Panel, I will definitely be at FogCon for the rest of Saturday and likely Sunday, too. 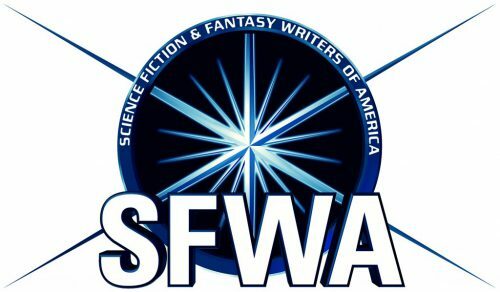 If you are a member of SFWA, the Science Fiction and Fantasy Writers of America professional guild, then you may nominate works until February 15, 2018 for the Nebula Awards. Here’s how to vote. If you attended WorldCon 75 and/or registered as a supporting or attending member of WorldCons 76 or 77 by January 1, 2018, keep your eyes on this page, as nominations are bound to open soon and will likely run through March. WorldCon awards the Hugos every year. I’m planning to attend both conferences, and gosh, it’d be awfully sweet to have an extra special reason to go. 😉 But seriously, the Nebula Weekend is a fantastic professional conference for speculative fiction writers, and well worth your time and money–and you do not need to be a member of SFWA or even a writer to attend. I have never been to WorldCon before, but I am hoping to get on paneling or in a reading session for this one, and I think it’ll be great fun. Thank you for considering my 2017 published works for nomination! 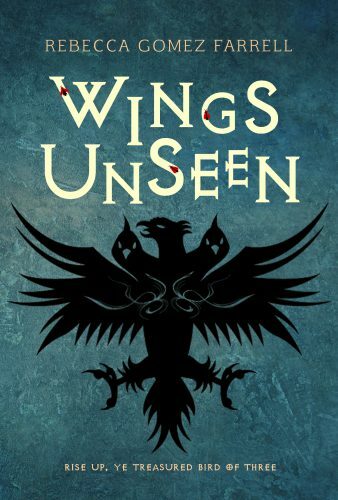 Wings Unseen is a YA classic epic fantasy told with modern sensibilities. To fight an invisible foe, three young adults must first fight through their own expectations, beliefs, and shattered dreams to save their shared world. For full information and accolades, head to its page at Meerkat Press. 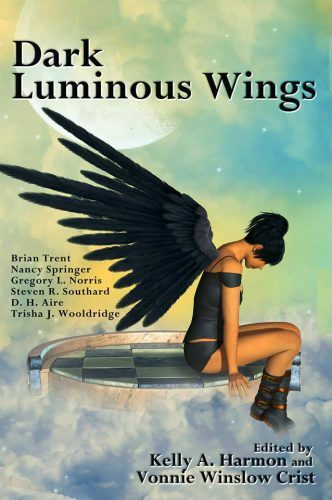 “Treasure” appears in the Dark Luminous Wings anthology from Pole to Pole Publishing, published October 2017. It’s a fantasy fable that features a thief thrust into a culture very different from her own, so different she has a difficult time believing such a culture is real…. and is under threat of a flying sea monster and the lure of a rock pillar that manifests jewels. More info here. 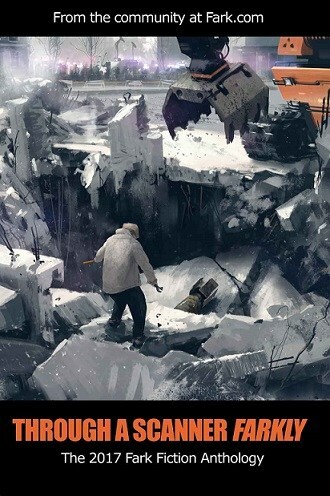 “Garbage” is a humorous sci-fi tale about crazy old ladies, immature teenagers, and aliens with an unusual appetite. It has a fair bit to say about what it means to be native and how that shifts over time and with new waves of immigration. “Garbage” appeared in Through A Scanner Farkly: The 2017 Fark Fiction Anthology, which was published in July 2017. More info here. 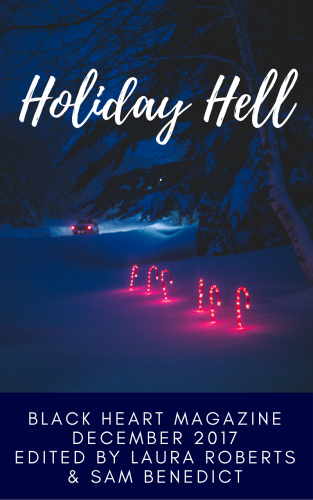 I’ve barely had to the chance to tell folks this flash fiction series even exists since its publication in the Holiday Hell issue of Black Heart Magazine. Exist it does, and I’m proud of these one-shot explorations of what a holiday invasion might mean in three very different situations: a morning full of death and poinsettia, a Thankgiving dinner of new dishes and newly embodied relations, and the chaos of Christmas day for one very anxious, superpowered mom. More info here. This piece of horror flash fiction, done in a poetic prose style, tells of a woman struggling with her biggest regret in life and sentenced to forever re-remember it. 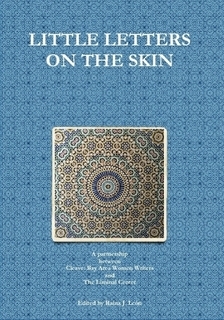 It appears in the August 2017 chapbook collection, Little Letters on the Skin, from Cleave: Bay Area Writers and the Liminal Center. More info here. Best of luck to all the authors out there with eligible work for 2017! May the best of our work get on those ballots. Order Your Autographed Gifts of Wings Unseen by 12/16! 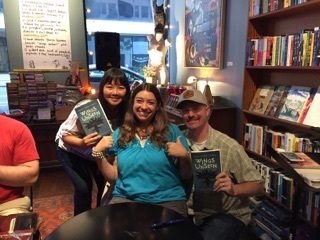 My friends, Paul and Ann, whom I kind of like, I guess, getting their signed copies at my book launch. $15 includes the book, and my signature and a personal message, filled out from your instructions on whom I should address that message too. It also includes shipping costs! What is Wings Unseen? Here’s my full page on it. This price is only available until 12/16. After that, I won’t be able to ship via media mail in time for Christmas. But I am happy to use a more expensive shipping option to get it to your loved one for opening under the tree! Loki guaranteed for good cuddling. How to order? You can contact me via direct message on Facebook, Twitter, or Instagram or just email me at becca@thegourmez.com. We’ll discuss payment and shipping methods – either Paypal, Square, or Venmo will work, and I am amenable to other shipping options, but the price will reflect those other options. Happy holidays, dear readers, friends, and family! Be first to know what I'm publishing next! I’m Reading at the Inaugural Parallel Lit 4/12! Copyright © 2019 Rebecca Gomez Farrell. All Rights Reserved.